CEOs for Cities recently held an event called the Livability Challenge in Indianapolis. Among its major themes was creating more beautiful cities. I did not attend this, but someone who did told me, “The last 3 days have been some of the most inspiring days of my civic life in Indianapolis.” I’m not surprised. CEOs for Cities a) just gets it and b) puts on the best events I know, both from a content and organization perspective. If you ever get the opportunity to attend one of their events, I can’t encourage you enough to do so. But having an inspiring conference does nothing for you if you don’t follow through on it and execute. The real problem in cities isn’t coming up with good ideas, but actually executing them. I know for a fact that Indianapolis has no shortage of good ideas. I’d like to think that I’ve provided a large number of very low cost good suggestions over the last four years on this blog. But what has been done? 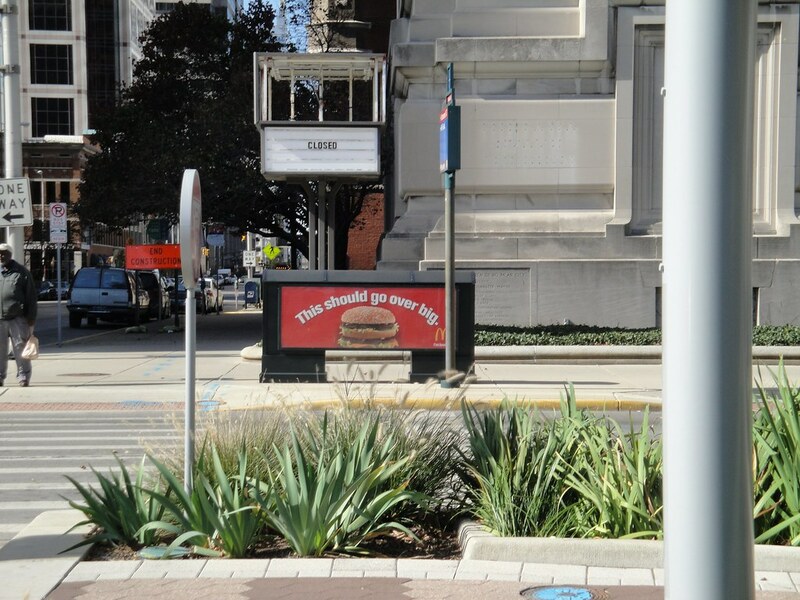 In the spirit of livability and beauty, I want to highlight a couple of concrete actions that can be taken right now, immediately, that require little to no money and would contribute to a more beautiful, more livable city in Indianapolis. Pretty ghetto to put it mildly. This building was temporarily used as the main library during a renovation and expansion project of the central library building. The top portion of the sign used to hold a library logo. Someone went to enough trouble to remove that, but left this behind. Here’s the sign in context along the Cultural Trail. Now is the time for someone to pick up a phone, call DPW, and have them send a truck over immediately to get rid of that thing. What kind of message does this send to an outsider who has heard Indy brag about this Cultural Trail? What are they likely to think when they see this in the core of downtown right along it? This looks like a still from a post-apocalyptic thriller. What’s crazy about this is that it isn’t in some run down, blighted ‘hood. Directly on the other side of that bridge is a large office park with the tallest building in suburban Indianapolis and the Keystone at the Crossing mall, which is the most upscale shopping center in the state, with stores like Saks Fifth Avenue and Tiffany’s. Again, you’re a visitor, prospective resident, someone coming to a job interview in one of those office buildings, and you see this. What are you likely to think about Indianapolis? 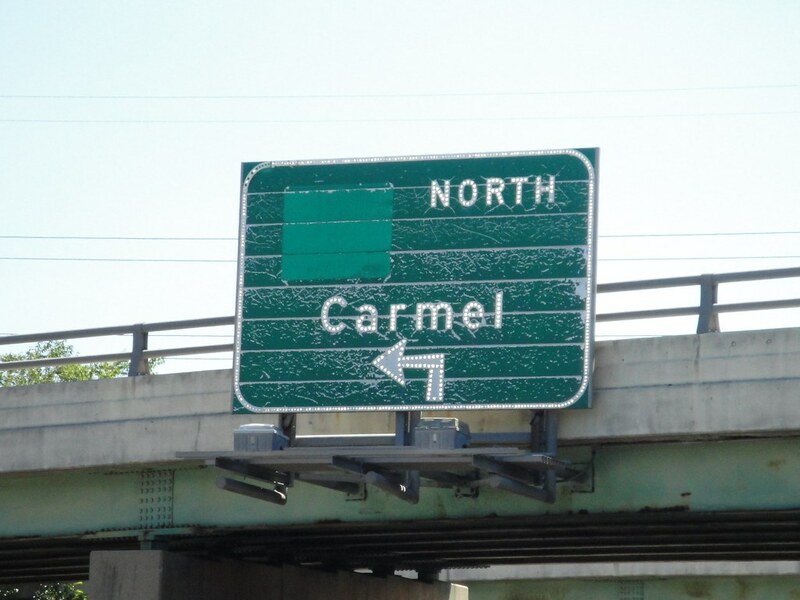 The fact that this sign says “Carmel” is telling. The border of Carmel is one mile north. And once you hit it at 96th St., everything is pristine. They wouldn’t tolerate this kind of blight, certainly not when the government owns it. Combine stuff like this with better schools and lower taxes and it is any wonder that those with choices are bailing out of Marion County? Someone once told me they thought INDOT still owned that sign. Does it look like INDOT thinks they own it? Send a crew out there one night ASAP and take both of these things – and all the brackets and such – down. There’s no need to even replace them. Many cities avoid the use of big green signs at just this type of interchange. 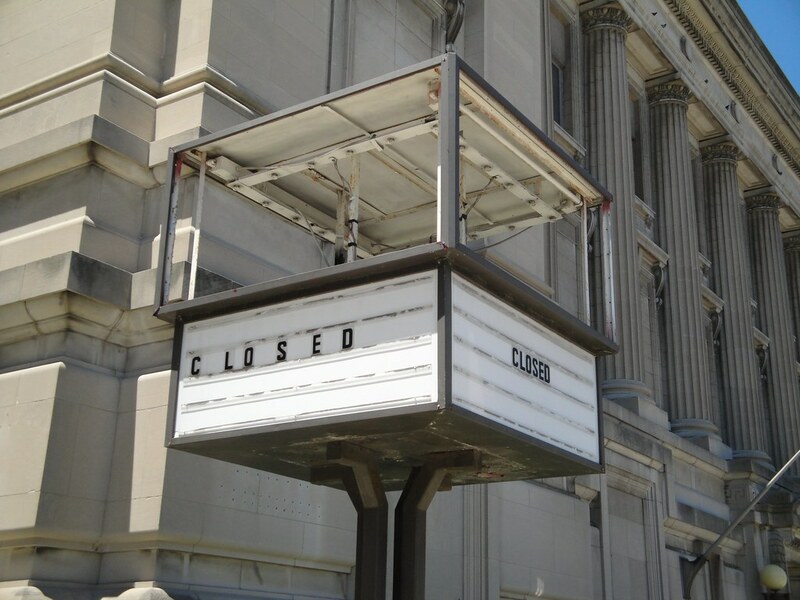 Our central cities like Indianapolis are in a brutally competitive market. To win you’ve got to bring your A game every day. You’ve got to show that you have some pride in your city. Cleaning up obvious blight in high profile locations is an easy place to start. Let me stress that I don’t blame the current administration for this situation. As I noted, those green signs are on their third mayor now, for example. No, this sort of thing has been standard operating procedure for far too long. It’s time to get serious through both words and actions on walking the real beauty and livability walk. There are huge numbers of low cost items just like this that could be done starting today to begin the process of building momentum, racking up wins, and showing that the quality of space in the city is on an upward, not downward trajectory. The focus of a recent popular TV show episode was a “hoarder” character. The psychologist character explained the phenomenon of “clutter blindness”. This is it: we all drive or walk by these things daily and minimize or blank them out as if they’re not there any more. But first-time visitors see them and aren’t impressed. Don’t just take down the Carmel sign, though, replace it with one that says Keystone on it so people will know where they are going. For too long after the inside-465 state highways were abandoned, there were a bunch of signs that just said “Indianapolis” on them after the former state highway shields were removed, so there was no way to know from the signs what road you were actually getting on. This one at least still provides some sort of useful information. I don’t think I’d be turned off by a dirty road sign or a gutted city sign. What I find livable isn’t pristineness, but walkable streets, with ample commercial development that isn’t completely boilerplate. Alon, that may be true, but commercial development is hard while removing a few junky old signs is easy and costs virtually nothing. Agreed there could be a few simple improvements, remove old signs that this city could do. Although with more focus on reality, more in line with this town needs an enigma…not just a wipe, I have to comment on actions that will create sustainable effects. So Far this Indianapolis and Indiana administration is all talk! “Saving Money”, The “Office of Sustainability” has the messaging down, and now with the “ReBuild Indy” initiative there is a glimpse of marketing that they get it, but sadly no action. To reduce City, States and Federal spending, the current administration needs to pull the guns out and start with some action, meaningful impact projects within the community, spending some City dollars to leverage more dollars from the State and Feds again to be spent on more meaningful impactful ways. There are several projects that are just sitting on the sidelines, Ready to Go, and would be great success’s if but not for the City delays. There are many still waiting for this City leadership to effectively and efficiently create Smart Growth, the multiplier effects of saving, and the return on investment at meaningful, imperative locations. It is well know that complete street districts, within the preferred quarter are the core generator of tax revenues for the City, and the State, but so far there is more action congruent with siphoning off these assets. I have heard talk about the name, “Bulldoze Indy” and/or the “Office’s of Creating Poverty”, promoting more regional expense & outgrowth. We need leaders who are willing to fund Smart Growth, rebuild our historic community corridors, the arteries that feed our communities, and our City, which feeds our State. We thought that our leaders have learned this lesson. We need Mixed Use Redevelopment, which is not hard when you have leaders that are focused on actually doing it, effectively and efficiently. The lack of actions congruent with these sustainable solutions is why people are leaving and why we can’t clean up even the prevailing “signs” of deteriorated rot. Smart Growth, if our leaders spent less time trying to sell off said pieces, and more time trying to fix what we have then we’d be on that path. I live on the northside of Indy (Noblesville) and always make comments to my wife about that sign on Keystone. Great suggestions. It’s the little things that can make such a big difference. I think this is what I’m finding so depressing about Indy lately. I take the 30th St. onramp to I-65 south every morning, and over this entire summer, I’ve seen the weeds grow tall and the trash accumulate. The City isn’t taking care of it’s own spaces, and the entire city looks like we forgot about it. Has anyone even SEEN a streetsweeper recently? I probably haven’t in the last year. I’m responsible for maintaining a large piece of vacant property in Kokomo, and I’ll tell you, if I let the grass get higher than about 6 inches, I’m getting grumbling from the City. And their street sweepers chase our trucks all over the place (and if they don’t, the residents call in and complain about the mess). It may be an industrial town, but it’s definitely a clean one. What’s more, the resident’s expectation is that the City will keep it that way. I think we’ve become so accustomed to the mess around here (like Chris above is saying), it doesn’t seem to cause much of a stir. I’m with Mazarin. The city has really cut back/dropped the ball on weed removal, public trash pickup, and other far noticeable maintenance issue than these signs. Yes the signs should be addressed, but there are far more pervasive maintenance issues that are seen more up close and personal my both reeidents and visitors alike on a daily basis. The lack of diversity in those photographed at the end of the CEO for Cities report is somewhat surprising to me. It doesn’t seem very representative of our community, but since there is no text you don’t know the roles these individuals played or how other stakeholders might have been engaged.